This fern can be grown as either a terrestrial or epiphyte. 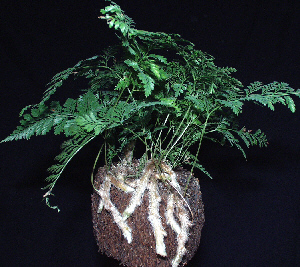 5" finely dissected fronds rise up from it's furry, silver rhizomes as the plant grows and matures. Likes a moist but well drained substrate and medium to bright light. Tolerates periods of dryness well. Available plants are young and shipped in 2" pots. Pod in photo is not included but is available for purchase separately.